Eat healthy calorie-dense foods to gain weight safely without eating refined sugar or simple carbohydrates. Avoid over-processed food products in favor of real whole foods, including lean protein and healthy fats. Successful weight gain requires you to consume more calories than you expend, but the quality of those calories matter, it's not just about quantity. 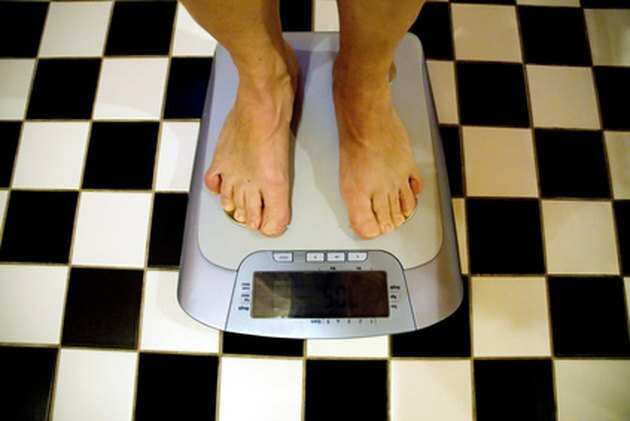 Weigh yourself to get an accurate starting weight and calculate how many pounds you wish to gain. It requires 3,500 extra calories to gain 1 lb. Add 500 calories daily to gain a pound a week. Eat high-calorie snacks between meals to add to the day's total intake. Protein and carbohydrates have 4 calories per gram, while fat has 9 calories per gram. Nuts and nut butters are popular snack choices, high in protein with healthy unsaturated fat. Peanut butter has 1,600 calories per cup, cashews have almost 800 calories per cup. Choose starchy complex carbohydrates such as potatoes, oatmeal, rice and other whole grains. Eat foods that are as unprocessed as possible. Drink your calories in the form of milk, juice or supplemental protein shakes made from either whey or soy. Juice and milk can be high in natural sugars, which your body uses differently from refined processed white sugar. But if you want to restrict all sugars, choose a no-sugar-added protein shake. Continue to exercise, but limit cardio to no more than three 30-minute sessions per week. When lifting weights, do fewer repetitions with heavier weights. Do not train more than four times per week. Lean cuts of beef, such as flank steak, and fatty fish, such as salmon, are common proteins for gaining weight and building muscle. Two teaspoons of peanut butter mixed with 1 tbsp. of flax seed oil adds 500 calories and important omega-3 fatty acids. Most green vegetables are low-calorie foods but still need to be an important part of your healthy diet, even if they don't help you gain weight. Gain weight slowly, and continue to exercise to maintain a healthy fitness level. Manage your stress. Elevated cortisol levels make the body burn muscle and store fat.